Within 10 minutes of experiencing both Louisville and Lexington, I was pleasantly surprised to learn there is way more to what these cities offer than the once a year Kentucky Derby. Downtown Louisville is booming with galleries, restaurants, performance spaces, funky loft buildings, and tree-lined streets with old Victorian homes. In a nutshell: Over the last decade, Louisville has been reinvented. Entire neighborhoods, such a Butchertown and East Market, have exploded into a culinary dream. The East Market District is perhaps the best of the city’s revitalization projects. Dubbed NuLu (New Louisville), the neighborhood features antiques stores and a plethora of new galleries. Just a 50-minute drive from Louisville is Lexington, also known as the Horse Capital of the World. The picturesque drive between the two cities offers views of horse pasture after horse pasture in all their grandeur. Lexington is known around the world for its role in producing champion racehorses. The rich horse farms of Central Kentucky are where the top racehorses are bred, born, trained, officially registered, bought, sold, retired to stud, and eventually buried. The vibe Lexington has is vastly different from bustling Louisville. From its scenic byways and highways, one can turn off and find smaller towns offering historic, scenic, and peaceful places, and it appears there is always some type of seasonal event happening. All of the hotels and inns in which I had the opportunity to stay were uniquely different and all are very much worth mentioning. The Brown Hotel in Louisville is a stunning 16-story property with a distinctive English Renaissance design and is listed on the National Register of Historic Places. Not only is it known for its breathtaking turn-of-the-century architecture, but also locals and visitors visit for its legendary dish, “The Hot Brown”—an open-faced turkey sandwich with bacon and a delicate Mornay sauce. Now it may not sound exciting, but take my word, there is a reason why it has such a world-renowned reputation. It’s decadent. In addition to being introduced to my first Hot Brown, I also welcomed my first Mint Julep, a Kentucky staple. 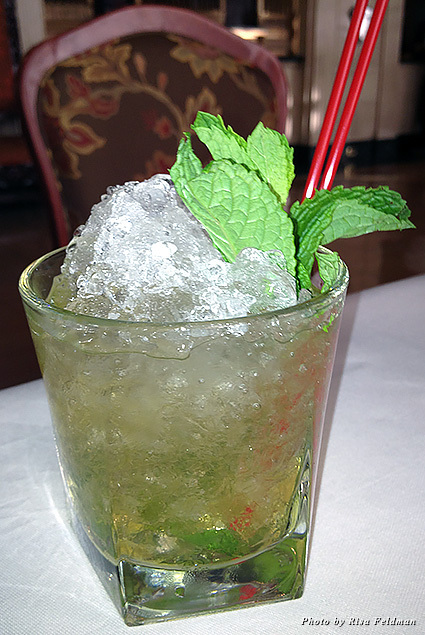 The drink is the perfect blend of bourbon, sugar, and mint. Another breathtaking hotel in Louisville is the Seelbach Hilton, home to the Oakroom, Kentucky’s first and only AAA five-diamond restaurant. The restaurant's decor is reminiscent of an old gentlemen’s billiards hall. Be sure to have a drink at the Old Seelbach Bar (voted one of the top 50 bars in the world) right off the grand lobby. Opposite of the Louisville hotels’ grand style was the Gratz Park Inn in Lexington. This is a boutique hotel that honors the décor of the past with some modern comforts. It is located in Lexington’s Historic District, within walking distance of all downtown has to offer, and has an abundance of historic charm and Southern hospitality. I was thrilled to be able to take part in quite a few of the main attractions these two cities offer. Even though I am not a bourbon enthusiast, visiting some distilleries was a must, since Kentucky bourbon has such a famous history. I suggest those who have a fondness for bourbon take part in the Bourbon Trail, which stretches 70 miles and covers nine distilleries (suggested time needed to visit them all is three days). I visited the Evan Williams Bourbon Experience, located in downtown Louisville's historic Whiskey Row. I also toured Buffalo Trace Distillery in Frankfort, which holds the title of “world’s most award-winning distillery.” Both guided tours featured an operating artisanal distillery, where you learn the process for making bourbon, as well as very generous premium bourbon tastings. Whether or not its Derby day, week, or season, visiting a Kentucky horse track is a must. I was lucky enough to visit on the opening weekend of Churchill Downs and the closing weekend of Keeneland. Churchill Downs is in downtown Louisville; be sure to grab breakfast at Wagner’s Pharmacy right across from the track, as it’s the go to hangout for jockeys and sportswriters. It has barely changed since 1922, and the Wagner’s counter displays fading photos of legends—two- and four-legged—from Derby history. Browse over them while you dine on a cheap but tasty home-style, no frills breakfast. The Keeneland track in Lexington is a National Historic Landmark. This track features beautifully landscaped grounds that are open to the public every day. Fans and horsemen alike can enjoy its spectacular racing, attend one of its annual horse sales, or simply visit the grounds and enjoy Keeneland’s timeless beauty. Keeneland is also the world’s premier Thoroughbred auction house, selling more champions and stakes winners than any other sales company and unmatched in terms of offering the best horses, state-of-the-art sales facilities, and a range of client amenities. And what’s a visit to Lexington without a visit to a Thoroughbred farm? Come spring, Lexington tourism will offer horse farm touring excursions. If my experience at Runnymede Horse Farm in Paris, Kentucky, was any indication of what’s in store, this new program will be hugely successful. The Clay family who owns Runnymede is dedicated to raising great Thoroughbreds that have been a hallmark for generations. Runnymede’s incomparable history goes back to 1867, when Colonel Ezekiel Clay founded the farm and began to breed Hall of Fame horses including Ben Brush, winner of the Kentucky Derby, and Hanover, who won the Belmont Stakes and 17 consecutive races. Visiting both cities was not just about horses and hooch. I was there just before Halloween, and for the second year in a row Louisville hosted the Jack-O-Lantern Spectacular. This art installation is held in Iroquois Park for more than a month and features 5,000 carved pumpkins lining a quarter-mile walking trail, illuminated at night. The event surely earned its right to use “spectacular” in its title, as it was just that. Picture a farmhouse colliding with eclectic décor. Now add in a charming outside patio entrance and a uniquely intimate interior dining area, topped with the tantalizing culinary creations of renowned chef Michael Crouch. Chef Crouch’s menu features exquisite French-American fusion cuisine—and now you know why this bistro is such a hot spot. What I loved and found so unique was Bistro 1860 has a special à trois niveaux style of dining. This trademarked style offers three sizes of portion: bite size, appetizer, and entrée portion. Whether you know exactly what you want or prefer to sample a variety of tastes, you can! My favorites included the lobster Hush Puppy, the pan-seared lump crab cakes, the Hudson Valley duck confit strudel, the espresso-grilled Creekstone ribeye, and the grilled Colorado rack of lamb. Bistro 1860 also offers a Cruvinet system, which keeps up to 54 opened bottles of wine as fresh as the moment they were uncorked for up to six weeks. The restaurant’s extensive wine list offers something for even the most discriminating connoisseur. Proof on Main is located downtown in the acclaimed 21c Museum Hotel. With a commitment to local farming, the restaurant delivers plates infused with local flavor. The bar is a local hot spot and features more than 75 Kentucky bourbons. Complementing the culinary artistry are avante garde art exhibitions, curated by 21c Museum and rotating every few months. Chef Levon Wallace has created an extremely unique menu, with items such as whipped ricotta, charred octopus, roasted bones, diver scallops, and Woodland Farm hog chop. From award-winning Heirloom Restaurant in Midway, Kentucky, stems Distilled at Gratz Park Inn. Chef Mark Wombles has outdone himself and with his team has designed an artful and elevated approach of farm-to-table Southern cuisine. The ambience was casual yet upscale; the tasting meal I had showed off chef Wombles’ talent of artistic expression in both ingredients and presentation. Some items I sampled included the vegetable and pear salads, the Delmonico steak, the pickle-brined fried chicken, and the Weisenberger grits. I found this dining venue to be a hidden gem. It is located among the impressive architecture and monumental buildings of Lexington’s downtown area and houses a full-service bar and a private outdoor seating area, but what really made it stand out to me was how it was exquisitely decorated in a distinct Shakespearean and Boudoir style. The menu itself has a broad range of items and offers breakfast, lunch, and dinner. No matter which you choose, I promise it will not disappoint. Lexington and Louisville are two destinations so very different from each other yet so close in proximity. A trip to Kentucky is very much worth it to discover and enjoy what this dynamic duo has to offer.